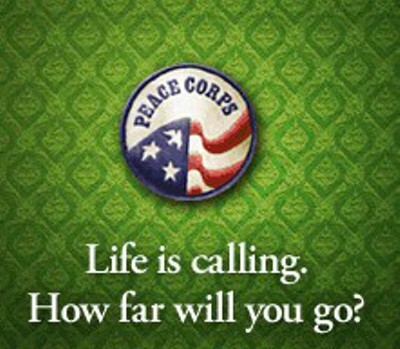 The Peace Corps has long been the gold standard for American volunteering. A huge commitment most of us can’t make, two years in service to a foreign community is a lot…and it has immeasurable rewards. I have a few friends who have traveled the Peace Corps path and would not change those experiences for anything–a few who have done back-to-back stints, giving years to service. For the longest time, since the organization’s founding in 1961, you signed up and crossed your fingers, waiting to hear when and where you would be sent and the type of work you would do. Your preference or desire wren’t part of the equation–you were willing to work, they would send you where they needed you most. Now, as of changes announced today, the exhaustive application process has been streamlined, and registrants can now CHOOSE what nation they will serve and the type of project in which they will engage (Agriculture, Community Economic Development, Education, Environment, Health, Youth in Development, or a grab bag “Anything” category, which still plays by the old rules of matching able bodies to greatest need). This is huge. The website now lists all open projects, the type of work required for the project, and departure dates, so volunteers can more harmoniously engage in the work that inspires them most and where their talents and interests are strongest. How about you? You busy for the next couple of years?